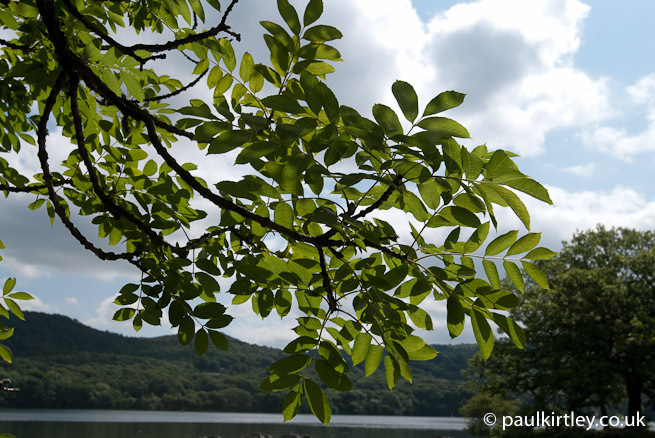 An ash tree by Lake Windermere, Cumbria. Photo: Paul Kirtley. Common ash, European ash or just “ash”, Fraxinus excelsior, is a common and widespread tree of northern Europe, including the UK and Ireland. Ash trees make up a significant proportion of British hedgerows and are a key component of many mixed deciduous woodlands in the UK. In the summer of 2013 a friend of mine sent me a link to an article in the online edition of the Independent newspaper entitled Save the ash tree? Half of us can’t even recognise an oak. 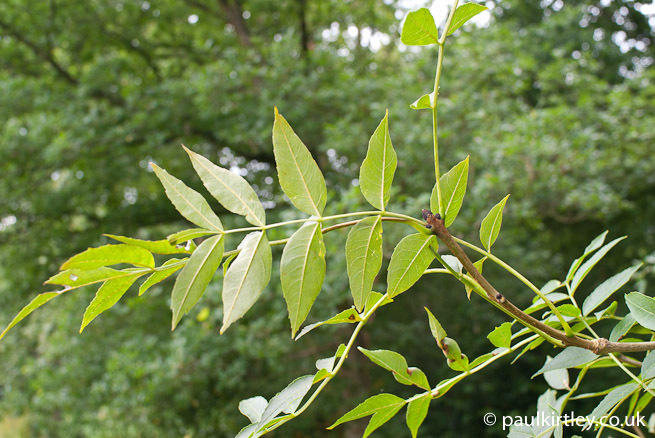 A YouGov poll conducted for the Woodland Trust was cited in the article; amidst all the publicity about Chalara ash die back, only 17% of those polled could recognise the leaf of common ash, Fraxinus excelsior. And no, they weren’t required to know the scientific name, or have any detailed knowledge of the species, just to identify an ash leaf. So how do we identify an ash tree? What are the key identifying features to look for? Which ways of recognising ash are easy to pass on to other people? Ash trees reach dizzying heights relatively quickly Photo: Paul Kirtley. Common ash is tolerant of most soils except those which are excessively sandy. Ash does particularly well on chalky or rich soils. It is an abundant species and present in most wooded areas of the UK. Ash trees will happily take a place as part of a hedge and ash forms a significant portion of hedgerows around the country. Here you’ll recognise its presence by its leaves, buds and characteristic upturned shoots (see below for more details). 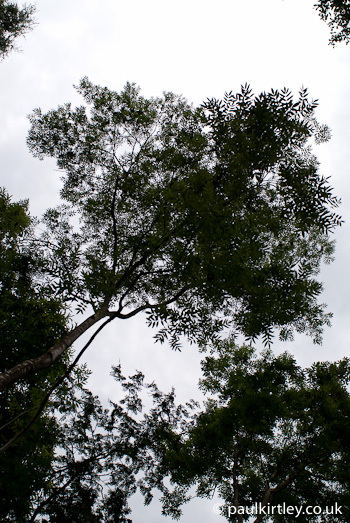 Unfettered, ash grows to be one of the tallest trees in the forest, up to 30-40m (100 -130ft). This is suggested by the excelsior component of its scientific name, which means “higher” or “loftier”. You’ll look up the beige-grey trunk of relatively modest diameter and be surprised how far up it goes. Plus, unlike other large but more spreading British trees such as English Oak, the branches of ash have a character more of “reaching for the sky”. Even the tip of each drooping shoot sweeps back upwards towards its end. 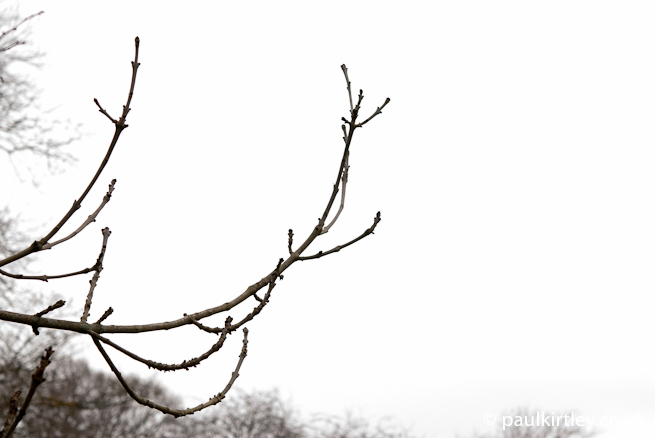 Ash is a deciduous tree, losing its leaves over winter. But some key identification features remain easily spotted year-round. 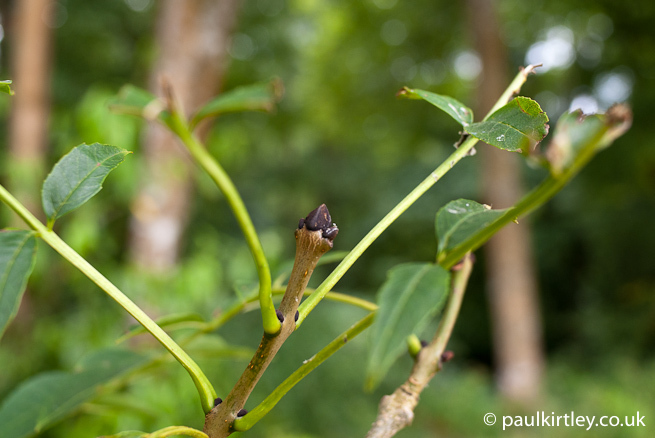 The buds of ash are one of its key identifying features. The buds are a sooty black, with one larger bud at the end of each shoot bracketed by an opposite pair of smaller buds a little further back. Shoots are a grey colour. The combination of sooty black buds and upturned grey shoots is one of the easiest ways of positively identifying common ash in the winter, when it has no leaves. The characteristic upturned shoots of ash. Photo: Paul Kirtley. 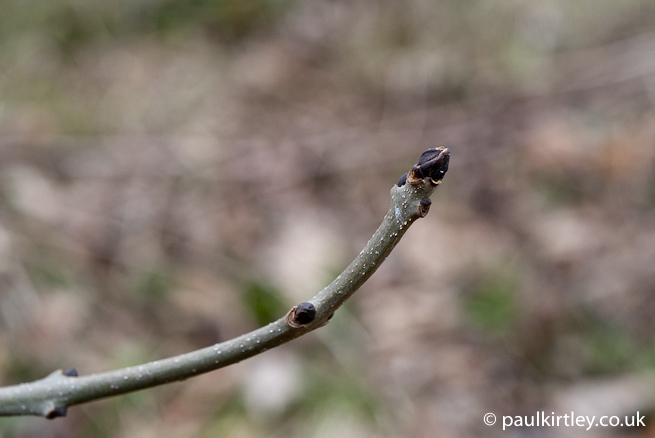 The distinctive sooty-black buds of ash. Photo: Paul Kirtley. Ash has a compound leaf. That is, a leaf which is made up of multiple leaflets. These leaves occur in opposite pairs. With the exception of the terminal leaflet at the end of the leaf, these leaflets are arranged in opposite pairs. There are typically 4-6 pairs, making 9-13 leaflets in total. Each leaflet is irregularly serrated, rounded at the base and pointed at the end. The side leaflets have no stem and connect directly onto the mid-rib of the leaf, which is slightly downy underneath. 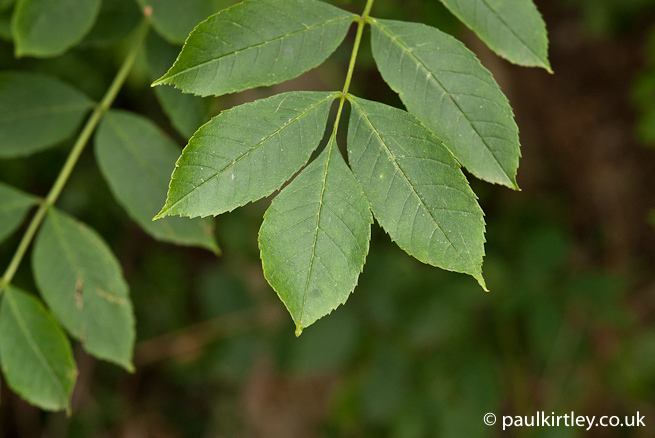 Common ash leaves are a rich green on the top and lighter underneath. Ash leaves are amongst the latest leaves to appear in the spring and the last to drop in the autumn. In the autumn, common ash leaves can briefly display a pale golden yellow before dropping from the tree. Leaf detail showing a couple of leaflet pairs and the terminal leaflet. Photo: Paul Kirtley. The underside of an ash leaf is lighter than the top. Photo: Paul Kirtley. Single ash leaf, fallen to the ground. Photo: Paul Kirtley. The bark of young ash trees is smooth and a similar grey to the twigs. As the tree develops, the bark lightens to a beige-grey but stays relatively smooth compared to the boles of other similarly sized trees. Eventually the bark develops some shallow fissures. The oldest of trees develop more pronounced fissures, and a darker grey colour, resembling the bark of mature English Oak. 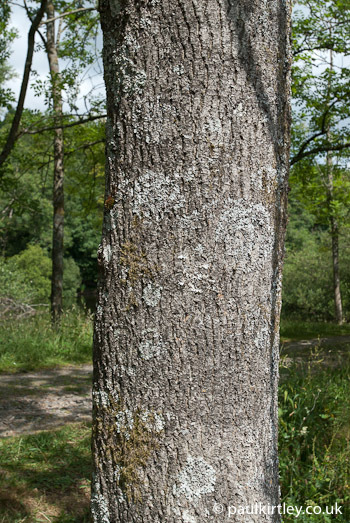 In areas where there is clean air, lichens also readily grow on the bark of common ash, which may mask the colour of the bark beneath. Smooth grey bark of a young ash tree. Photo: Paul Kirtly. 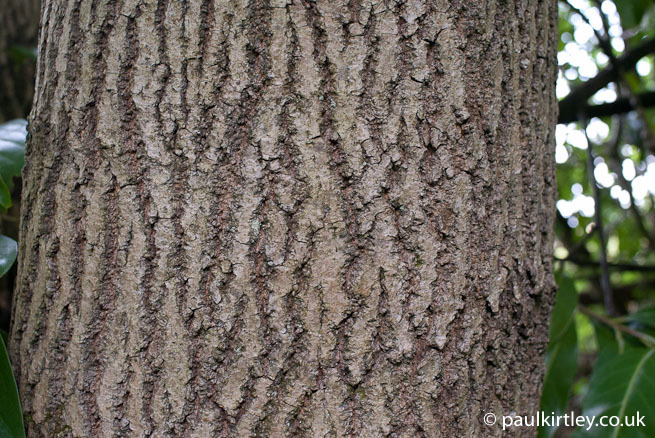 The smooth grey-beige bark of a larger ash tree. Photo: Paul Kirtley. Slghtly fissured ash bark, discoloured by lichen growth. Photo: Paul Kirtley. More deeply fissured bark of a mature ash tree, starting to resemble the interwoven fissures of English oak. Photo: Paul Kirtley. The flowers of ash are non-descript both to the eye and to the nose. The flowers are tiny, dark purple and appear – largely unnoticed – in clusters in the spring. The seeds that form in clusters following the flowers are much more noticeable. They take the form of a winged ‘key’, bearing some resemblance to the seeds of sycamore, Acer pseudoplatanus. 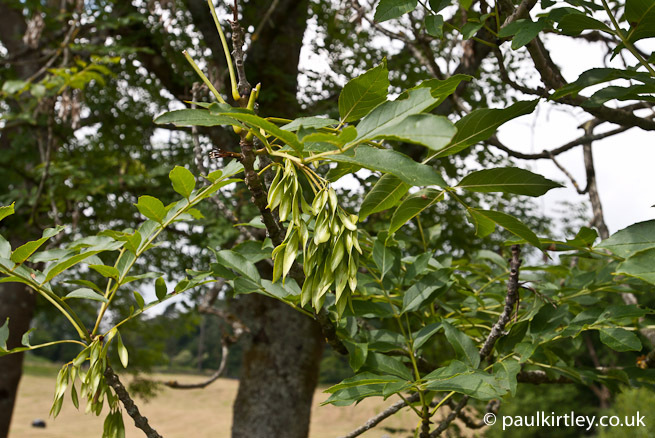 Common ash keys have only one wing, rather than the symmetrical wing-nut shape of sycamore. Ash keys start off green but have turned brown by around the beginning of autumn. 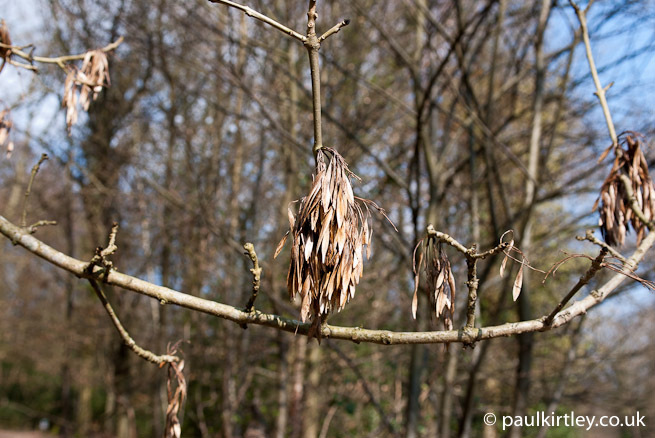 These brown clusters can stay on the trees long after the leaves have fallen and, if present, are an easily recognised identifying feature in the winter months. Green ash ‘keys’. Photo: Paul Kirtley. Ash is an extremely useful and valuable resource for the woodsman or woodswoman. It is certainly worth putting in the effort to learn to recognise it easily as well as spreading the word so that others can also more readily identify and appreciate this majestic tree of our woodlands. If you are fond of ash trees, please leave a comment below letting me and other people know why it’s a special tree for you. You forget they are there, you look past them when they are common and all around you but, when you move away it is trees like the beautiful ash that remind you of your northern home. Glad you found it so evocative Rory. Thanks for your comment. Thanks for your great comment. I’m glad you are continuing to learn both the practical skills as well as the knowledge regarding our trees. And there’s lots to be said for extending that knowledge to mythology. Some people don’t think it’s worth learning the scientific names either but it allows to access to more resources regarding the species in question. It also allows you to converse on a level with other knowledgeable people, particularly when you don’t speak the same language. Even when you do speak the same language there are often multiple common names which are quite local, so knowing the scientific name helps you realise you’re talking about the same species. Keep on enjoying your journey of discover Liam. Seconding this reason. Actually, the tree in front of my house (the “elm” in my website) I learned how to identify because I was reading mythology and thought for a min it was an ash. I tried to positively identify it as ash, and failed because it isn’t. That was a sad day. 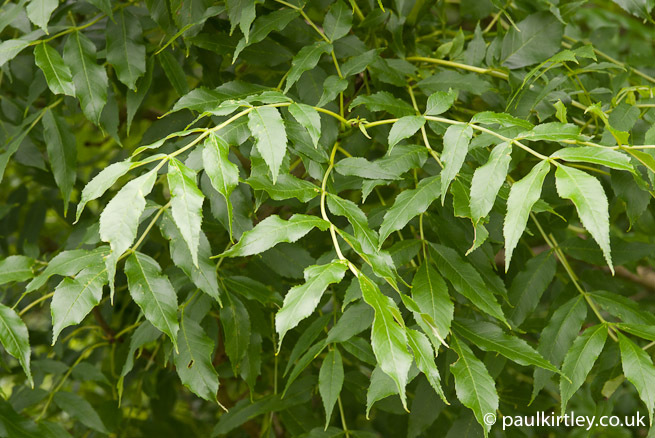 Ash is one of my favourite trees because it has so many uses..
Great article as usual Paul.. Yes, they are fantastic. Thanks for your feedback. Thanks for that guide. If I could have a book of that covering all those trees out there, I’d be very happy. You’re welcome. There are plenty around once you start looking, even in town. A very clear and concise reference article – what every beginner like me needs. Just to let you know, if you don’t alraedy, the FSC are releasing their ID apps for Android next year. Take care, Hayden. I’ll keep an eye out for the FSC apps. Thanks for the heads-up. Great article…am I correct in saying that Ash is also one of the very few trees where logs or rounds will burn readily when wet or green? Yes, it is often related that ash burns green. It is. It’s also often related that ash is excellent firewood. It is. The problem is that some then put two and two together and get 5, concluding that green ash is excellent firewood. It isn’t. Green ash will burn better than many green woods due to its relatively low water content. I’d still rather burn dead, standing, dry wood though. I have an old ash tree in my yard I love the tree hate all the seed pods! So many seed pods that no animals or birds eat. My house my car are full of them but it and my American elm are my favorite trees both are about 50 years old so they are awesome the American Elm spreads so wide with so much shade. My husband keeps calling it a Hackberry so now I can prove to him it is truly an ash tree.Thanks for the info! i live in Kansas so it does well here as well as up north. After Birches Ash trees seem to have been the species most damaged by the recent storm in the UK, at least near where I live in southeast England. The birches have shallow roots and much of our woodland has shallow soil overlaying the compacted sand and gravel laid down by the proto-Thames. So many birches simply blew over. The Ash trees seem to have weathered the storm in that they are still standing but have had limbs torn off. I’ve cleared several huge ash branches where they were blocking paths often having been flung many meters from the tree. Many of these branches have been fairly large: 25cm to 30cm diameter and have provided some excellent fire wood and I’ve also been able to make several tool handles from the fallen branches. I hope that where braches have been torn off the ‘wounded’ trees won’t succumb to rot or disease, although I fear the worst. Many of the larger ash trees hereabouts are clearly quite old and have been coppiced at some point so now have three or four main trunks, often covered by an orange-yellow lichen. Those that have the largest single trunks are often hedgerow trees on the corner of a field or serve as markers on parish boundaries. I’ve read recently that some ash trees are showing resistance to Chalara, and I hope that the Ash won’t go the same way as the Elm. Once you’ve got your eye in its clear just how common the Ash is and how different our woods and hedgerows would look without these fine trees. Thanks Fr Dave, I’m glad you found this useful too. It’s good to hear from you. Thanks for your detailed comment. Yes, I think the more time you spend in the woods, the more of this natural attrition you see. But it’s good that you have been able to make use of some of the materials made available to you, not just for firewood but also for tool handles, etc. – things that should last you a long time. I too hope that ash does not go the way of elm (as do a lot of other people) and the more we can keep an eye on what’s going on in the woods, then maybe we’ll be in a better position to understand and protect them. Second to the Birch tree, Ash is definitely one of my favorite trees. I really hope that they can find and grow a resistant strain of this beautiful tree. Thanks for this article Paul, that first picture reminds me of summer days when I was a child, laying on my back and gazing up through the sun dappled leaves to the blue sky beyond. Here’s to hope for the future. I found a 8 inch sprout in my back yard,looked kinda like my pecan tree. So I moved it to the front yard. Five years and 20 feet taller it is a beautiful tree we get many compliments on it. I live in sE New Mexico. The title of this article, really grabbed me. As truth be told i just about do. Plant and Tree identification is certainly my weak point. I got myself a couple of library books a couple of months ago ( yes I’ve paid my fine ) and I’ve been out with my kids learning them and myself. This is the method I go by. To be honest I can’t seem to see the woods for the trees, but i guess that’s part of learning. One day it will click. Paul as always, great article. Thanks. It’s good to hear from you and I’m happy this article was useful to you. Keep working on your tree identification – it really is a fundamental component of bushcraft. I understand the overwhelm when you open a book with hundreds, if not thousands of species in it. Where do you start? After a while though you will start to build up a framework of familiar species into which you can slot new additions to your repertoire of knowledge. It just takes time. It’s great that you are getting your kids involved too. I learned a lot directly and by osmosis from my dad and that has held me in good stead ever since. What a fantastic article! Thanks Paul, this is just what I (and many others I dare say) need. Every time I push myself to learn tree identification, I am simply overwhelmed by the hundreds of species in my reference books. I live in Ireland, and for the most part will never see half of those species. What I need is to take it one tree at a time. Learn it well, be confident in identifying it, and it’s uses in bushcraft, then move on to learn another one. Learn 10 or 12 trees that are local, and know what they can be used for. Use that as a base for expanding my knowledge further. I have a young family, and really want my kids to grow up learning about nature. Could I ask you to continue this with a series of articles on tree identification? One common tree at a time, with the fantastic detail you’ve give on the Ash. Maybe use the 12 trees that you wrote about in a previous article on identification in winter? Thanks for your feedback on this article. It’s good to know that it was particularly useful to you and pitched at the right level. As you say, there are likely others in the same boat. I think your methodical approach, taking a tree at a time, is a good one and I completely understand the overwhelm presented by comprehensive identification guides. I’ll do my best to make further resources available that will help you on your journey of learning and discovery. Plus, you know where I am if you have questions. Keep on taking it one step at a time. Like any journey, that’s how you get to where you want to be. Excellent, informative, well written article, Paul. I agree with JD, that a ‘series’ of these article on various trees would benefit myself, JD and so many others. I am ‘mobility challenged’, but I try to get away to wild camp when I can and I am looking forward to taking this information with me and learning more about our surroundings. Hopefully passing this knowledge onto my granddaughter (even though she is only coming up for 2 years old just now). I am a new subscriber to your blogs, Paul and I have found all the information you provide to be top notch. Keep up the fantastic work. Thanks for your feedback on this article. I’m happy it was useful and I’m glad you are able to pass onto your granddaughter some of the things you know. Rest assured that I’ll continue to add high quality information and photos on by blog. Please keep in touch and let me know what you think of my various articles. I remember a poem in the bushcraft book by Ray Mears. The last line, about ash logs for firewood is something like ‘buy up all that come your way, they’re worth their weight in gold’. Great article! Great site! Thanks for your kind words about this site. You can find the firewood poem here. Can you please tell me if there is an Ash tree that is very similar but has brown ash buds instead of sooty black? I’m trying to identify a tree that is not in flower. It is very likely an Ash tree of some sort and looks much like the pics above except the leaf buds are brown. Hi Heidi, thanks for getting in touch. Whereabouts are you/the tree in question? Is the European Mt. Ash trees suitable for my area of Central Wa. State which has a growing zone 5 climate (hot in summer and in the teens and snow in winter) after the Carlton Complex fire. We have an agency that have trees for us if we want them. Well written piece. The compositions tone exudes warmth and encouragement at a relaxed pace. That is, it does not proceed as so many scientific journals to resemble a dull inventory of characteristics. SC, U.S. , we seek out Ash trees in early spring when the Ashe’s mycorrhizal symbiotic partner, the Yellow Morel fruits there under . One salient characteristic of the White Ashe’s is their “slingshot” appearance . The trunk usually forks about mid height and often the trees lean. Thanks again for a lively yet studied article. Many thanks for an excellent article. I have been looking for a concise, clear identification guide specifically for the ash tree and this fits the bill perfectly. Now bookmarked for further referral. Thanks again, your work is greatly appreciated by us novices especially…. My pleasure Ian. Thanks for your feedback. Hi, The only tree that I could identify really was the Oak, but being a horse owner I seen these trees in my horse’s field and freaked as I thought they were Sycamore which is highly poisonous to horses. It was the “keys” that alarmed me so went online and discovered to my relief that they were Ash trees, thank goodness. Now I’m looking at all sorts of trees and wondering what they are and can now identify the “Rowan” tree in my garden, which I hadn’t a clue what it was as I didn’t plant it. I also identified correctly a Sycamore tree and thank goodness it’s a long way off my horse’s field. 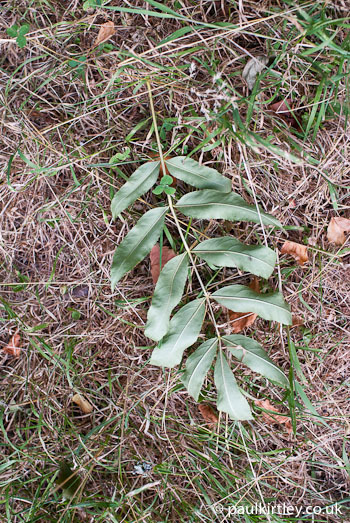 Without a doubt the best blog describing how to identify an ash tree. Excellent written description supported by brilliant photos. Thank you Steve. Your kids are lucky to have a dad willing to take them out and teach these things. Do the new leaflets smell like lemon? Not that I’d noticed Janet. I’ve been meaning to identify a tree that started growing in my garden about ten years ago for ages and tonight, with the help of your handy guide, I have discovered that it’s an Ash. I am trying to identify a tree that I thought was an ash. I have not seen any ash keys on it. I was concerned as the leaves brown off in Autumn rather like the illustrations of Ash Dieback. I thought it might be a sorbus of some sort but have never seen any fruits. What could it be? It grows on a grass verge by the road near my house. I am a fine art student making a propeller approx. 5 foot long out of ash. This was given to me by a local man who owns a wood yard. I am so lucky as this is a beautiful wood to work with, it has a subtle pink appearance and a sweet smell. I found your website whilst looking for some inspiration. I liked that the branches ‘reach for the skies’ as eventually this propeller will be fitted to an aeroplane and hopefully do just that. Like many of the commenters above, I was delighted to happen to stumble across your page. What a beautiful and wonderfully informative article you have created Paul. Just what I was looking for! And lovely photos, well done. I now live in Australia, and am trying to recreate a little bit of my youth in our garden here, and I have just ordered an ash, so I hope it grows for me..
Good luck with nurturing your ash tree. I’ve noticed quite a few ash saplings tend to have an s-shaped bend in them. I have grown a Fraxinus excelsior Westhof’s Glorie One-leaved Ash since 1980. Unfortunately it has succumbed to the terrible Emerald Ash Borer. It is rampant in the GTA area (Toronto, Ontario). Now it is noted that this European ash is susceptible to ash borer. It wasn’t known back in the 1980’s. It is a seedless variety, that is why I bought it that long time ago. It has to come down, we have tried keeping it for as long as possible, but it is dying if not dead this spring. Sad to see it come down. Hi, I managed to save an ash tree quite recently that was to be pulled out of the ground for a house extension. Im hoping to turn the small tee into a bonsai. I’m just wondering day what temperatures the ash can live at- I know it would require dormancy but I am wondering if it could be kept indoors thoughout the other seasons. I’ve just put down Robert Macfarlanes The Old Ways and felt quite ashamed about my lack of knowledge about the trees, shrubs and wild flowers I see all around me. So am on a mission to learn. Sitting now under the shade of a fairly young Ash near home in West Yorkshire. All with the aid of your guide . I’ve just put down Robert Macfarlanes The Old Ways and felt quite ashamed about my lack of knowledge about the trees, shrubs and wild flowers I see all around me. So am on a mission to learn. Sitting now under the shade of a fairly young Ash (now i know) near home in West Yorkshire. All with the aid of your guide . Hi Paul have a large wild plot at the end of our garden in south Wales only neighbours on one side I’ve cut a twenty four ash tree down on neighbours boundary but many more saplings are springing up on the wild in boundaries sides. I was worried and thought I’d uproot them but now I’m going to leave them as a woodland after all Ysdraggil was the sacred tree of the Celts. Paul, two years ago I bought a house with a large ash tree at the bottom of the garden. At that time (December 2014) it was covered in dried brown seed pods. I expected them to drop off in the spring, but they didn’t. They were still there the following winter and have stayed there all this year as well. There have been no new green pods. . Any idea why this has happened? Hi, really enjoyed the site but! didnt find what I was looking for. We have several large Ash in our small garden in Cornwall, we have only here three seasons and I am still trying to sort what tree`s we actually do have here. There are two huge Ash trees side by side with such different characteristics that I doubted if they were actually both Ash. One had lost all its leaves by mid October, but retained lots of seed pods, the other has no seed pods but is still in full leaf (27th Oct) and this is the exactly what happened last year. ? Ik bezocht deze site omdat ik wilde weten wat een ashtree was. Substanties van deze boom worden namelijk gebruikt door Yves Rocher, een bedrijf dat verzorgingsproducten verkoopt. Het zit bijvoorbeeld in hun dagcrème 24H Comfort Nourishing Cream. En is geschikt voor droge tot zeer droge huid! Bij de ingrediëtenlijst staat: Fraxinus ornus sap extract. Mooie duidelijke site Paul. Thanks! Hi Jemma, thanks for your comments and I’m delighted this article has been so helpful to your daughter. Het zit bijvoorbeeld in hun dagcrème 24H Comfort Nourishing Cream. En is geschikt voor droge tot zeer droge huid! Bij de ingrediëntenlijst staat: Fraxinus ornus sap extract. Thank you for a very detailed article. Would it be OK for me to use some of your photos to make a fact sheet for my Year 4 class so they can identify ash trees in the school grounds? Sure Suzie, no problem. Have fun! Thanks Paul… they’re perfect for axe handles! A most excellent article sir! 🙂 I rediscovered the woods after a particularly engaging holiday forest trek and I have been addicted to researching the identities, uses and folklore of British trees ever since. Articles like this make an alien world to me so much easier to find my way around. Thank you and keep up the good work! Hello. I have been researching my local tree species here in Ireland and found this article really insightful. Information like this is really invaluable in todays world of over complicated living, learning about the land around us and how to use it is very important for us to not loose track of what we are. 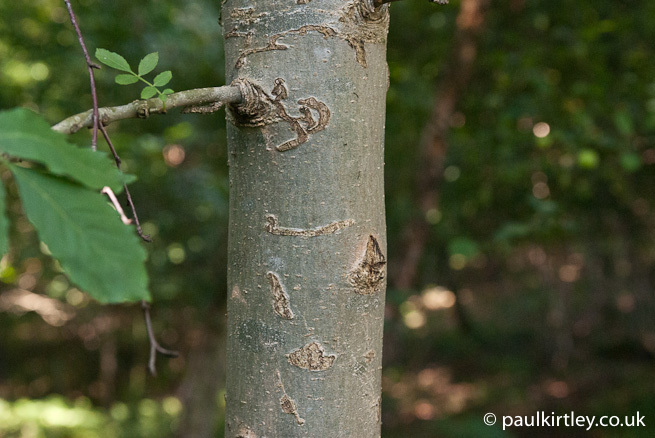 This article is an incredibly useful guide to identifying an ash tree – one of the most common trees in the UK. Thank you for this. 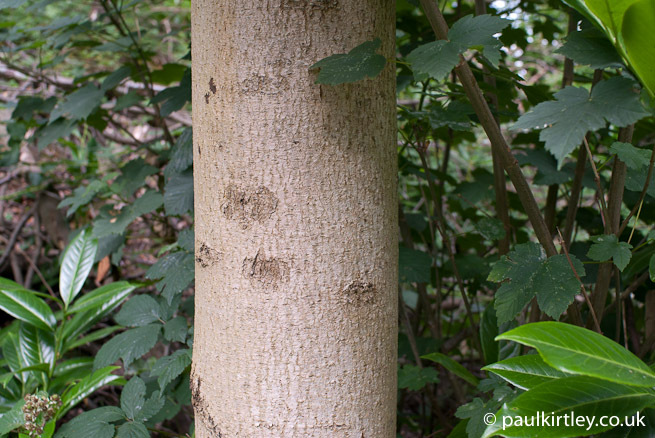 For us here in Kent, the ash is a special tree not only for its wide variety of uses – as hardwood for building homes, as shelter for wildlife. and as an integral part of British culture and history – but also for its distinctive features in the Kentish landscape. Given the problem of ash dieback, we intend to record and celebrate the natural and cultural value of the ash tree. We hope you can help us celebrate our emotional and ecological connection with this majestic tree. I am the owner of a log burner. Had it about a year, and I have been trying to identify wood acquired by myself ever since. I now know that I have some ash wood. It’s very difficult to id wood when all you have to go on is the bark. Usually, by the time I get it, that’s all that is left and the owner can’t tell me what it is. I have a lot of studying to do, but I’m beginning to just enjoy wood for wood’s sake. Hi Julie, it is nice to go deep into the nuances of wood, the bark, the grain, the colour, the smell, the weight, etc. You can discern a lot, once you become familiar. Keep getting led to ask trees in my dream 2-3 times know lol. Looked them up and came across this info. Pretty cool trees!. God bless and love to all. Jesus loves us all!! Ash trees may be beautiful but only in the right place @ NOT in my neighbours garden which borders on to ours. It is already 20ft high. Grrrr!!!! I have an ash tree growing in my back garden that I’ve been advised to chop down as it will get under the foundation of my conservatory. It’s approx 20 years old and you can see the roots coming through to the surface. I want to patio over or around it but have been told the tree will ruin the patio and rip it up with its roots. Can I keep having it cut back to maintain it and keep it small (ish) or will this kill it eventually? Can I pave around it? Will it lift my patio? What’s the best thing to do with it? I’m loathe to chop it down but fear it needs to grow and I’m worried that chopping it back every year will permanently damage it but similarly I don’t want it to get too big.. Can anyone advise via email? many thanks! Great photos and thank you for the article. You mention that the Ash is useful in many ways to the woodsman. What are some examples other than as firewood? I scanned the comments before posting but didn’t see much beyond tips on identification. Hi Clay, ash species are generally both tough and resilient. Ash has good properties for bow-making as well as axe handles and handles for othet tools (not as resilient as hickory though). Larger spoons, ladles etc carved from ash are also very durable. The bark can be used for containers and baskets. The keys (the winged seeds) can be pickled. There were some traditional medicinal uses of the tree too, including treating fevers. I can’t speam to the effectiveness of the latter, though. Lovely read, I found your site trying to find how to tell if my tree ( fb Great British Countryside- Daily Tree ) is male of female , we’ve named her Lady Fraxinus but may be we’ll have change that to Lord check us out I try to post daily pics from the same place. Hi John, thanks for your comment. I’m glad you enjoyed reading this. What a wonderful article and such interesting responses. I’m near Manchester UK and rescued a small Ash tree from my neighbours garden about 4 years ago. I thought it to be some unusual type as the leaves were very small, but now it has become established and has grown rapidly, and it has just flowered for the first time, oh the joy! It’s great to know I’m not the only one who’s crazy about Ash trees. I’m a woodturner and as is wonderful Turnery timber, both green and seasoned. It’s so useful for handles etc. as it absorbs shock and vibration, but more than that for a Turner, it’s pale colour and beautiful open grain provides a perfect canvas for an infinite number of colouring and finishing techniques. It is also wonderful for furniture making and veneers for doors, as I’ve seen in classy office buildings and medical facilities. This year my wonderful fraxinus excelsior is just about big enough that it will provide much needed shade at the end of my garden so that my dogs and I will be able to relax on the occasional hot day under its shade. My Ash tree is a haven for birds already and I so happy that I have such a healthy tree, so keep your fingers crossed everybody that it doesn’t get the dreaded Ash die back disease. I have a good feeling that it’s safe. Our neighbour has three giant ash trees bordering our garden. One – a manna ash I believe – produces millions of tiny sticky flowers which fall on our terrace. The terrace – newly paved last week as roots from the tree raised the old paving, making it dangerous to use – is now stained by the sticky remains of the ash flowers. How long for it to die back! Love your blog. Came across it when looking for fasting growing and ideally weeping trees to plant in eat facing chalky garden for our children to use as a den and be outside in nature. Any other suggestions greatly appreciated. Used this to identify an Ash at the bottom of our garden in our new house. Cannot wait to see it in the spring/summer next year. Worried about Ash dieback though. Can I Prevent it at all ? Thanks for your comment. I’m glad you found this guide useful. As far as I know, there is nothing you can do to prevent a tree from being infected with ash dieback, although there does seem to be increasing evidence that it is maybe not spreading as quickly as was initially feared and that a good number of trees seem to have immunity/resistance. It might be worth doing some Google searches to see what the current state of play is. I’m sure new information will continue to come to light as we learn more. Paul, a great little five minute read to really get people understanding how to identify the trees all around us! I will be reading more ASAP! Glad you liked this Gareth. I used ash for the first time on Saturday, to turn a rounders bat, and I was amazed at how easy it was to work with. I will definitely be putting time into learning how to identify ash when out in nature. Hi Joseph, thanks for your kind words about the article here. I’m glad you enjoyed working with ash and I’m sure you will do again in future. It is a lovely timber.